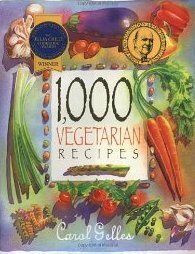 1,000 Vegetarian Recipes by Carol Gelles is one of my favorite cookbooks. If you think vegetarian food is boring then you NEED this book! I stumbled across it at a used bookstore and to this day I can't figure out who would actually want to get rid of it. There are simply too many wonderful recipes to name. One of my favorites is her recipe for Zucchini Bread. Most Zucchini breads are very dense and moist but this recipe is a fluffier, drier (without being too dry) version. Unfortunately, I can't give you the recipe. I'm sure that would be violating some copyright law or something. What I CAN do is show you how I have adapted it. Although her recipe is FABULOUS, I try to always do things a little healthier or a little "cleaner" if you will. (If you aren't sure what Clean Eating is then you should check out my earlier post on Clean Cookies). Please note that I like to make Zucchini muffins rather than bread because my kids love them (horray for veggies) and they are easier that way. But you can still use my recipe to make bread if desired. Obviously, just use a 9x5 bread pan instead of muffin tins. Notice the Turbinado sugar is larger and has a brownish tint? Next comes the lemon juice. Normally, I use a wooden juicer for fresh lemons and then strain them using a small mesh seive. I was watching Everday Italian one day and saw Giada just squeeze the lemon and drain it with her hand. I wanted to look cool like Giada and tried it out this time. Well, lets just say I got lemon juice in my eyes and seeds in my batter. Not cool! So, juice at your own risk! Next mix in the grated zucchini. I like to use a giant box grater to do mine. Lastly, turn the mixer down to low and slowly add the dry ingredients. Spoon about 1/4 cup of batter into each section of the muffin pan. Bake for about 20 minutes, until a toothpick inserted into the middle of one of the muffins comes out clean. As tempting as it is....let cool completely before eating. It sticks to the paper less that way!